Some children deal with new experiences and people with relative ease. For other children, there are reasons to worry about meeting new people, trying unfamiliar activities and beginning school. Anxious children may anticipate all sorts of dreadful outcomes that parents, caregivers and teachers don’t even consider. They may anticipate problems and focus on them, certain that outcomes will be unpleasant or even dangerous. 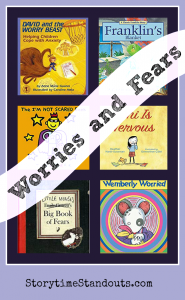 Enjoying these picture books together will provide opportunities for children to watch as a picture book character successfully overcomes fear and worry and manages a first day in a new classroom, sleeping in a dark room or listening to a thunderstorm. 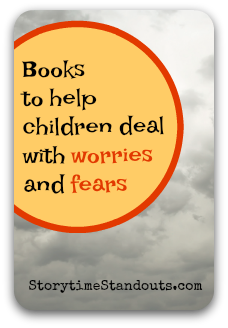 David and the Worry Beast was written especially to help children cope with anxiety. David’s worry beast causes him to worry when he plays basketball, when he’s at home and when he is at school. His anxiety grows and grows until he learns specific steps to cope with his worries. 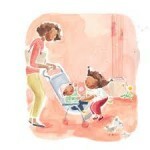 In addition to providing tips for children, the authors also have suggestions for parents. When Franklin’s favorite blue blanket goes missing just before bedtime, he is distressed and has trouble settling down to sleep. Franklin tries to remember where it might be. The following day, Franklin visits his friends and discovers that they also have comfort objects that help them to manage challenging situations. 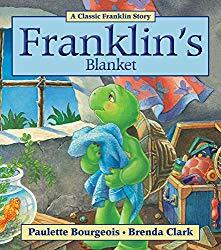 Franklin’s Blanket features familiar characters and offers gentle reassurance about managing emotions, including fear, with a Teddy Bear or a cozy blanket. There are things that make Noni feel anxious, including her relationship with a friend and world events. When we meet Noni, she is particularly concerned about starting school. Her family members reassure her that all will be well but Noni likes the comfort of home and being near to her mama. Noni imagines all sorts of things that could go wrong at school and is relieved when she doesn’t get lost, her teacher isn’t a monster and she is able to open her juice box. 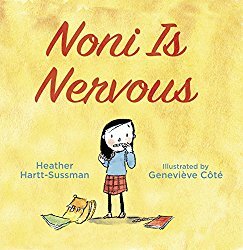 Noni Is Nervous will comfort children who are contemplating a new experience. Suitable for boys and girls aged four and up, the cheerful illustrations depict a racially diverse classroom and enhance readers’ understanding of the emotions that Noni is experiencing. 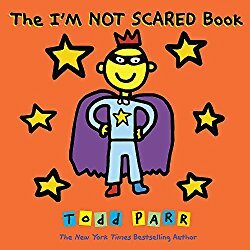 Todd Parr writes about and illustrates several typical childhood fears including fear of the dark, of dogs, of starting school and of getting lost. Illustrations show both boys and girls (and a bear) in a state of being afraid, encouraging readers to take a closer look and gain understanding. Bright, bold illustrations are well-suited to a small group read aloud. Children are shown with a variety of skin colors including blue and purple. A good choice for a preschool or kindergarten classroom. Little Mouse draws, writes and creates collages to express fear. 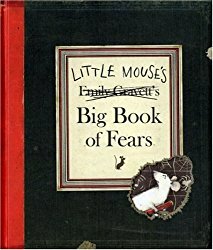 A fascinating and engaging format that includes cutouts, a foldout, a flap to lift and nibbled pages, Little Mouse’s Big Book of Fears is a relatively dark picture book that is best-suited to older children (aged 5 or 6 and up). Winner of the 2008 Kate Greenaway Medal for distinguished illustration, this is an inspiring book that could be used to encourage young readers to express emotions through artwork and writing. Wemberly is a little mouse with big worries. All day long, she finds reasons to worry at home and away from home. Her family tells her not to worry but that is easier said than done. When it is time to start school, Wemberly’s fears seem to multiply. She worries all the way to school. Fortunately, Wemberly’s new teacher introduces her to Jewel. Jewel has not joined all the other mice, she is standing off to one side, observing. Before too long, Wemberly and Jewel are sitting together and Wemberly’s worries have subsided. Wemberly Worried is a thoughtful, reassuring story that will provide reassurance to young mice (and children!) who are concerned about starting school. illustrated thoughtfully, not only are skin tones (hair color) diverse, Mr. Henkes also includes a young mouse who uses a wheelchair. From the moment we arrive on earth, each of us has the potential to change the world by loving, sharing, listening and helping others. Lively illustrations and an important and timely message encourage each of us to consider making a difference and how we contribute to the world around us. Because of You would make a cherished gift for new parents or your favourite preschooler.